This messy, quirky semi-concept album was not the RZA solo debut that the Wu faithful were hoping for. Fans had been promised The Cure, a proper RZA album that surely would have distilled the darkest and spookiest elements of the Wu sound with their leader’s sharp lyrics and universal ambitions. That album was scheduled and then scrapped several times; then RZA announced that he was leaving music to study medicine and actually cure cancer; then a few blunts later, that plan was scrapped as well. At some point, this album was pieced together, a conceptual mess ostensibly about a superhero named Bobby Digital. The concept doesn’t come together at all, but there are some great moments in among the unnecessary skits (“Unspoken Word,” the Deck produced “Kiss Of A Black Widow,” the RZA and Meth collab “NYC Everything,” Ghost’s verse on “Holocaust (Silkworm)”). 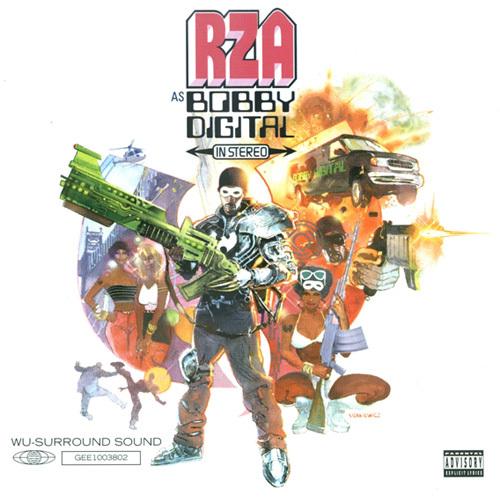 This album also marked a shift in RZA’s production style, from the dusty sample heavy beats of the classic era to more keyboards and spacey ambience. Nothing wrong with that, but the execution just seemed lazy. The classic Wu Tang sound was darkly atmospheric and hyperdetailed; some of these tracks just sound like sloppy keyboard stabs. There’s some good material buried in here, but you have to skip over some real dreck to find it. The Cure – the real RZA debut that might have achieved the same high atmosphere as Liquid Swords and Cuban Linx… – exists only on bootlegs or the dreams of Wu disciples.